Are you needing a morning-after cure? Spain—a great land for partying—takes very seriously the day-after resaca, hangover. The prescription begins with churros y chocolate, fried fritters and thick, dark hot chocolate, to finish the late-night revelry before heading home to bed. The next day, several robust soups are touted as sure-fire cures for what ails you. One is sopa de picadillo, an enriched chicken-ham broth with chopped bits of ham, egg and croutons. But nothing works as well as sopa de ajo, garlic soup. Garlic soup starts where French onion soup leaves off. Huge flavor, simple to prepare, rustic and real. 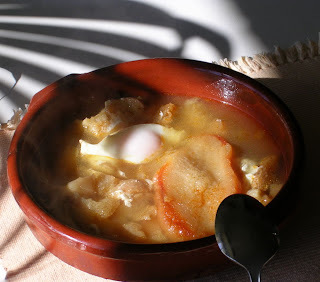 Although every region has its rendition of garlic soup, the Castillian one is the best known. From the Puerta del Sol in Madrid to the village plaza, the custom on New Year’s Eve is to eat twelve grapes, one at each of the twelve midnight bells, thus guaranteeing a year of good fortune. I didn’t go to town last night to join revelers in the plaza to welcome in the new year. I enjoyed a quiet dinner at home by the fire with friends and a bottle of cava. Charlotte brought grapes picked from her vines, still sweet. A movie on cable TV. So, today, the first day of 2010, I’m feeling just fine, but still thinking about that great garlic soup. HAPPY NEW YEAR! — ¡FELIZ AÑO NUEVO! Toast the bread and set aside. In a large cazuela (earthenware casserole) heat the olive oil. Add the diced ham and chopped garlic and sauté until the garlic begins to take on color, about four minutes. Stir in the pimentón and cumin and immediately add the broth. Add salt to taste. Add the toasted bread to the cazuela. Bring the broth to a boil, then reduce the heat and simmer for five minutes. The bread should begin to break up in the broth. With the soup bubbling, break each egg into a saucer and slide it onto the top of the soup. Cover and let the eggs poach until the whites are set and yolks still liquid, about 4 minutes. Serve the soup in the same cazuela. Making this on the first day of 2012 for, ahem, the stated reason. I made it a few weeks ago for the first time and found it much better than the method I'd used before (from one of Penelope Casas' cookbooks), which involved frying the bread. Thanks for an awesome recipe! Jennifer: Glad you like this recipe. Hope you made it for the 1st day of 2013 as well! Happy New Year.